I decided to do a post on how to add personal touches to your kids room decor. It was not easy because they are slobs, so I had to photograph very creatively. I also had fun using some cool apps on my iphone to enhance the photos. There was not a magic app to clean their crap up, can someone get on that! My youngest daughter, the pack rat, wanted a black polka dot and aqua room. I ordered personalized wall vinyl to go above her bed. She helped me pick it out and we ordered it from Etsy. We also used black polka dot vinyl on her closet doors. I hung large metal letters that spell the word Love above a black spray painted cork board. She hangs her necklaces on the metal letters. Sorry I could not show more in her room but she has been saving every scrap of paper for the last 5 years, it’s not pretty! My middle daughter, the mostly clean child (her father’s OCD rubbed off on her), wanted bright green with pink accents. 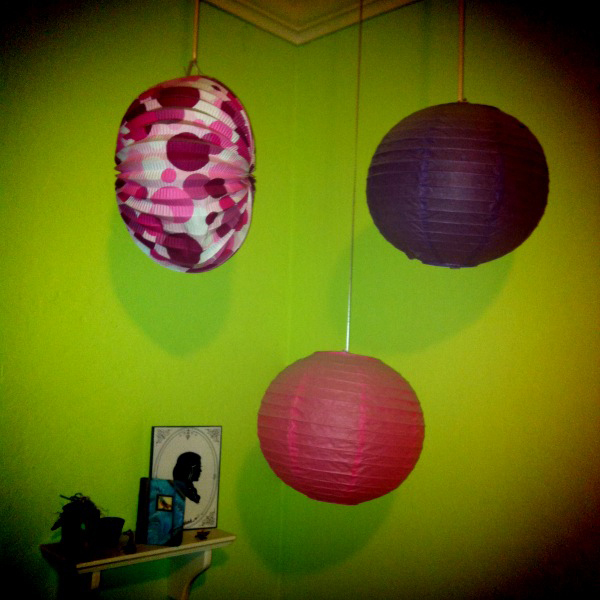 We used simple paper lanterns in bright colors to make her reading nook cozy. She also has a silhouette that we got at Disneyland. If you are ever at Disneyland I highly recommend getting these done. They are personally cut while you sit there and the price can’t be beat. We ordered her bedding at Pottery Barn Teen, but since the dog sleeps on her bed it is not as cute as it used to be! For my son’s room, he wanted the modern teenager room, no more solar system and glowing stars. I kept it simple by painting his walls gray and his closet doors with chalkboard paint. He actually uses the chalkboards for studying now. I added personal touches by using reflective outdoor numbers on his wall and making a custom poster with his favorite things. I also covered a cork board with maps that turned out really nice. Don’t expect clean rooms after redesigning your kids rooms but I do have to say that they keep them slightly cleaner when they are happy with the look. 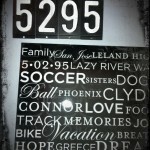 This entry was posted on 02/10/11 and is filed under favorite finds, home style, kids stuff, random goodies.